Actress Park Shin Hye's transformation into a 'traditional music girl' has attracted the attention of netizens. 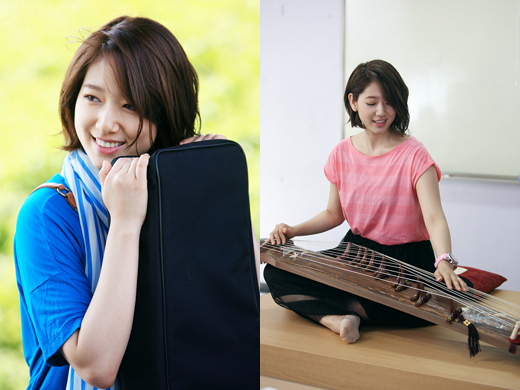 Park Shin Hye is playing the gayageum to portray her new character Lee Gyu Won, a traditional music student, in MBC's new drama 'Heartstrings'. According to producers, in Heartstrings, Park Shin Hye will star as gayageum prodigy Lee Gyu Won who goes to university to chase her dreams. Immense passion for traditional music as well as a 200% charming character will be exhibited through Lee Gyu Won. In real life, Park Shin Hye is inseparable from her Heartstrings character. Shortly after being cast, Shin Hye has begun to take special gayageum lessons from traditional music professors to prepare for her character. Her enthusiasm and repeated practices have caused recurring blisters to form on her fingertips. When asked about her character, Park Shin Hye said "When I first encountered Lee Gyu Won's gayageum, it seemed clumsy. But that's deceiving because the sound of it is very charming. Too bad I lack the time to admire the attractive sounding instrument. I will make use of my spare time to learn and practice as much as possible." she continued "In fact for Lee Gyu Won, rather than being the 'gayageum prodigy' that she seems to be, is under the influence of her grandfather to play the gayageum." How Gyu Won and Lee Shin(starring Jung Yonghwa) realize and chase their dreams not without some challenges is greatly anticipated. The drama will air its first episode on June 29.
i really can't wait !!! !